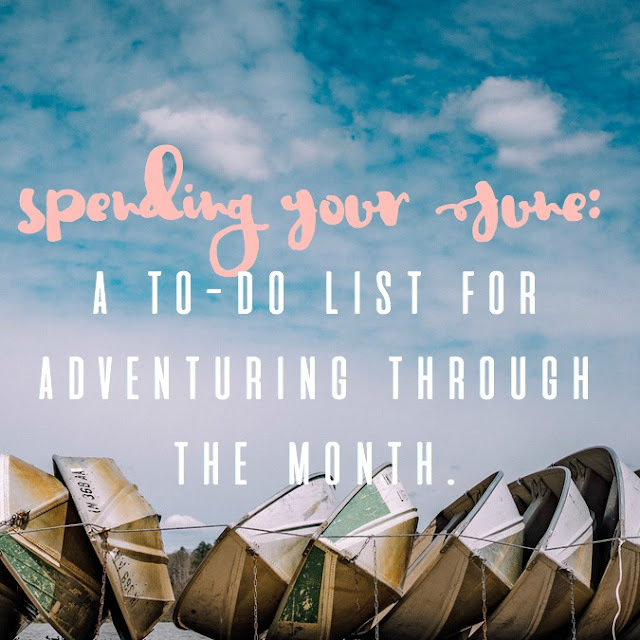 Spending Your June: A To-Do List for Adventuring Through the Month. | The girl who loved to write about life. Spending Your June: A To-Do List for Adventuring Through the Month. 1. Make a summer playlist. 2. Invest in a hammock. I have been the proud owner of a new hammock for six days now and can confidently tell you, YOU NEED ONE. 3. Get a cute water bottle. It's getting hot out there, and dehydration ain't cute. 4. Stop by a yard sale. 5. Make your outdoor area somewhere you like spending time. Whether you have tons of land or a tiny backyard or a one-person balcony, do what you can to make it somewhere you want to hang out. 6. Buy someone flowers at the grocery store. You're already there, so it costs you no extra time. Just $3 to make someone's day! 8. Pre-make and freeze a bunch of smoothies. 9. Go for a walk at sunset. 10. Find yourself a pool. Whether this means buying a membership somewhere or forcing someone who has a pool to be your friend or buying yourself a kiddy pool...do what ya gotta do. 11. Binge-watch Gilmore Girls in preparation for the new mini-series! 12. Sidewalk chalk something! Leave a little love note in your driveway or the sidewalk in front of your favorite coffee shop! 13. Make pitchers of fruity water. 14. Make grilled pizza. The perfect summer dinner. 15. Buy (or build!) an outdoor game. Giant jenga or corn hole! 16. Go to Home Depot. For no reason. And then leave with 87 project ideas. 17. Have a movie night. 18. Eat popcorn for dinner. 19. Buy a tropical scented candle for summer. 20. Revisit a project you let fall to the wayside. That book you were writing or that dress you were making or that room you were redecorating, and just stopped. 21. Learn to play a new card game. Poker! Blackjack! Gin Rummy! Learn them all. 22. Send someone a handwritten card... without ever having to leave the house. 23. Remind yourself of all those things you said in January that you wanted to accomplish this year. June is the halfway mark of 2016! 24. Make grilled blueberry muffins. I know it's bikini season, so I'm sorry. But cut a muffin in half, butter it, and throw it in a pan or on a grill. 25. Print some pictures that make you happy and tape them up. 26. Go without makeup. It's too hot for all that. 27. Go to the library. 28. Try out some new grill recipes. 29. Go to a restaurant you've heard nothing about. I love the Home Depot idea! My boyfriend and I love to go to Home Depot on date nights, mainly because it's the only place that isn't crowded on Friday nights. And we always leave with approximately 37 new project ideas or new items on our renovation wish list. I always look forward to these lists. Now I want a hammock! I always look forward to these posts! Yay for summertime! I so dearly love summertime in Florida! I have already crossed a few of these things off (hello sweet tea, you are my life line) and will be doing many more of these! I so want a hammock! And now I want to grill muffins...ha that will not help get rid of the baby weight!! pregnancy cravings are REAL and now i must absolutely get a sweet tea stat. STAT! MFD wants a hammock. I need a bigger yard before I'll commit! Love this adventure list :) I just made grilled pizza last weekend - I'm obsessed! My fave is caramelized onions and blue cheese. Yes to buying someone flowers while at the grocery store. In fact, one of my co-workers is having a rough day and I'm about to go back in and was trying to think of something small I could bring her. Flowers! Duh! I just binged Gilmore Girls over the past couple of months and now I'm sadder than ever that I'm out of episodes to watch now! (My husband is also pretty hooked as well, ha!) I can't wait for November! I've always wanted a hammock! I would lay in it and read all day. Great list! Fruity water is the best!! And I'm burning a coconut candle right now so yes to the tropical candle!! Love this list, and now I'm totally trying a grilled muffin. What a brilliant idea! I need to go back and watch alllll of Gilmore Girls. I missed a lot when it originally aired. Mmmmm I want a Popsicle!